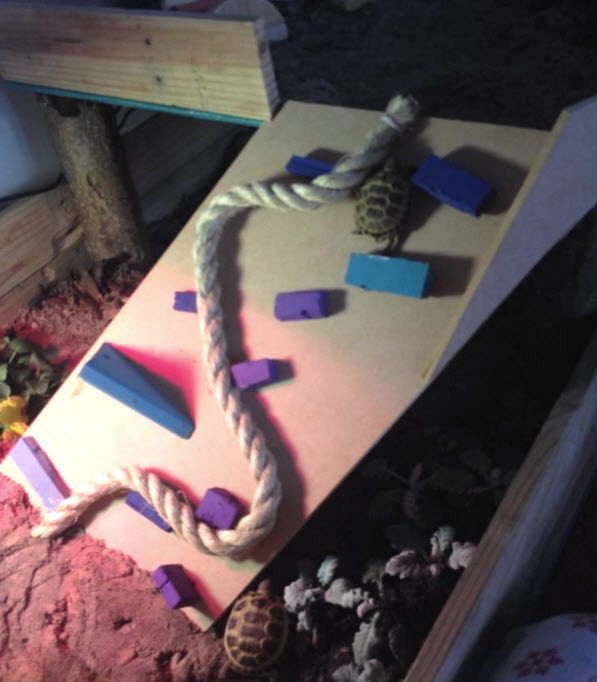 Help your tortoise stay fit with an obstacle ramp! Get a piece of wood and cut it into the shape needed for a ramp to an upper level in your tortoise’s habitat. Glue a piece of rope across the top of the ramp, winding it back and forth. Attach various sizes of wood blocks in scattered locations across the rest of the ramp, keeping in mind that the blocks need to be short enough for your tortoise to climb over. Attach extra pieces of wood along the sides of the ramp if needed to prevent your tortoise from falling. Consider making multiple ramps and switching them periodically to prevent your tortoise from becoming accustomed to the obstacles.